I love trains. They’re probably my favourite mode of transport after driving. If I could take a train to Australia, I so would and in fact, I read somewhere that China have started building some kind of tunnel for a train to go all the way to the states. How cool! Now, I’m not an actual trainspotter, that’s not my bag, but I appreciate what they do. I appreciate the way they look, and how they’re infintely more comfortable than, say, planes, which make me feel like I might drop out of the sky at any given moment, so I thought I’d dedicate this post to the awesomeness that are trains and how I’ve fared on them so far when it comes to travelling. Yes, that place again. In 2012, I was constantly on trains going to Marseille from London. A 2.5hr journey on the Eurostar, followed by about 3.5 hours from Paris to Marseille. Now. The Eurostar. I first took it around 2005 and was a bit unimpressed. I’d imagined something like the Orient Express (now that I would love to experience) but it was a bit shabbier than I was prepared for. Apparently, you need to travel first class where you get champagne and foot massages and all kinds of wonderful things. In France itself, I was blown away when I saw their double decker metro trains. Why don’t we have them in London? Think of how much roomier the commute would be! And it’s fun, being able to walk upstairs on a train (or is that just me?). Yes, some are dated and shabby, but who cares? Too cool. The TGV’s were double decker too and I just loved the approach into Marseille, one of my favourite cities in France. Stepping off the train into blazing heat and knowing I’d travelled from London to practically the mediterranean…do it! You must! If only to experience the sing song announcements from the French train information centre. Oh, what to say. Where to begin? Possibly the best trains I’ve ever been on. The train from Tokyo Narita airport was awesome, simply for the fact that the seats all turn around so everyone is forward facing. No backwards travel sickness happening there! The metro I was a bit disappointed with, mainly because it was older than I expected and despite staying in the business district of Shinjuku, I didn’t get to see that crazy business – you know, the ones filmed on YouTube where people are literally shoved into the carriage. What I did like though, was that the drivers wore white gloves and proper uniforms, with hats. Very tidy. But, by far and away, the best bit of the entire trip was the bullet trains. If you’re a foreign national, you can get a Japan Rail pass that basically allows you unlimited train travel for a set period of days. You can only get it in your country of origin, so you need to sort it out before you leave, but it is sooooo worth it. Not only were the trains beautiful, but the g-force was pretty cool. I remember bouncing along when I went to the toilet, it was that quick. Plus, the views on the way west towards Kyoto were awesome, including a close up of Mount Fuji. In sleeper class, you get to choose between a lower, middle or upper berth, and I would recommend you take an upper berth, reason being that during the day, the bottom berth is used as a seat and the middle one is folded down. The upper one is left well alone, so you can chillax to your heart’s content. Book your ticket well in advance. Otherwise, you’ll have to wait til the day before to get a ticket through the thadkal system (think I’ve spelled it right) which involves queuing for ages in the hope of getting a ticket in a specially held quota for foreigners to where you want to go. After India, the Thai train system was an absolute dream. I used http://www.seat61.com for all the info I needed and never looked back. They were so unbelievably clean and with two berths instead of three. 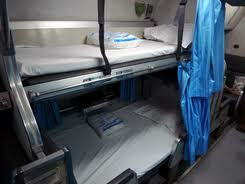 Again, I chose an upper berth and I slept a full 8 hours. There was a mattress with real sheets! And a real pillow! And a real blanket! And a curtain for privacy! You can see why I was excited. Other great additions were dedicated spaces for your bags that you can secure with a chain, and the toilets were all super clean with about 5 basins with SOAP. Heavenly. The only downside was that they come and turn the upper berth down and the lower berth into two chairs, so you pretty much have to be awake for that. It didn’t bother me, but if you’re someone who’s going to go and get wasted in the restaurant car, be prepared for an awakening. Speaking of, I’d highly recommend taking dinner or breakfast in the restaurant car instead of in your berth. It’s nice, usually with music or a film and obviously, you meet people too. In fact, I found that I met more travellers on the Thai trains than in India. Oh, and try not to be too rigid with your travel plans because they were horrifically off schedule every time. Apparently a 4 hour delay is quite normal – luckily mine weren’t quite that bad! Man, I love trains. Might actually look at inter-railing, I’ll be in heaven! Have a nice weekend all! Prev Post: Midweek Meltdown – Odesza, How Did I Get Here?